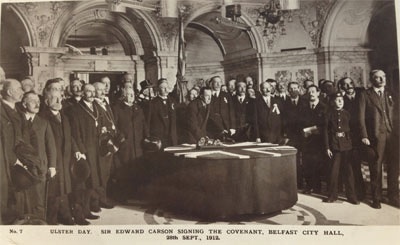 The 28th September 2012 will be the centenary of Edward Carson’s Ulster Solemn League and Covenant, signed by northern unionists in protest against the Third Home Rule Bill for Irish self-government. Far less well known is the ‘Alternative Ulster Covenant’, signed in October 1913 by Protestants from County Antrim in support of Home Rule and against partition. On the 24th of October 1913, a public meeting titled ‘Protestants against Carsonism’ was held in Ballymoney Town Hall, Co. Antrim. The meeting was called by Rev J. B. Armour, minister of the local Trinity Presbyterian Church and a liberal Home Ruler. Armour was an outspoken critic of the politics of Edward Carson, his Ulster Volunteer Force and the 1912 Ulster Covenant. The town of Ballymoney was chosen as the meeting place because the district had a radical Republican tradition going back to the United Irishmen in the 1790s. In the late nineteenth and early twentieth centuries it was also the hotbed of tenant rights agitation among the Protestant tenant farmer population. Over five hundred people attended the meeting, which overflowed from the hall onto the street outside. Mottos on the walls proclaimed ‘Ulster for Ireland and Ireland for Ulster’. Those attending included representatives of all social classes. Rev. Armour wanted to demonstrate the level of strong opposition to partition and sectarian politics that existed among Irish Protestants; for this reason the meeting was a Protestant one and Catholics were specifically asked not to attend. Two resolutions were passed. The first resolution rejected the claim of Carson to speak for Ulster’s Protestants and it pledged its signatories to lawful resistance to Carson’s activities. The second resolution was put before the meeting by Roger Casement. A British consul from Ballymena, Casement had gained international acclaim for his exposure of the exploitation of native peoples in the Congo and the Putumayo River region in Peru. This resolution was passed unanimously. Various contributions from the floor expressed anger at the thought of the division of Ulster and the exclusion of three of her nine counties. It was argued that if they accepted Home Rule, Irish Protestants would have at least one quarter of the membership of any Dublin parliament to protect them and to look after their interests. Partition, however, would bring about two sectarian states, where the major denomination in each would have too much power and would dominate religious minorities. Religious division rather than cooperation would become the order of the day. Others at the meeting suggested that partition would have a severe negative impact on the economy of Ulster and of Ireland as a whole. Further industrialisation would become difficult and Ulster’s natural farming communities would be divided from each other. Casement appealed to the spirit of 1798, when Irish Catholics and Protestants had fought together for an independent Republic. Mrs. Alice Stopford Green spoke next. Daughter of the Church of Ireland Archdeacon of Meath and granddaughter of the Bishop of Meath, she declared that she was present for the honour of the Protestant faith. She reminded the largely Presbyterian audience that both Irish Presbyterians and Catholics had historically been discriminated against by an Anglican, aristocratic ascendancy, and that both had been bond together in the struggle for political and social rights. The future of all Irish Protestants and Catholics lay together, not apart. She touched her audience deeply when she made reference to the Land League: ‘the Protestant farmers of Ulster owe their present prosperity to the legislation obtained by Southern sacrifice’. Captain Jack White also spoke. White was the son of a British general and himself a soldier, but his experience in the Boer war would turn him into a strong opponent of British imperialism. White declared that their common Christian faith held each man to be a son of God. ‘But let Protestants remember this: the test of their sonship of God is their brotherhood with man, and those Protestants who think and act towards their Catholic fellow-countrymen as though they were their hereditary enemies had better, for their own sakes, leave the name Protestantism and God out of the question’. This declaration was met with cheering and prolonged applause. After the meeting the Alternative Covenant was distributed and efforts were made to get a large number of Protestants in the county to sign. It is claimed that twelve thousand people signed the Alternative Covenant. Copies of the signatories were reported to be among Jack White’s papers when he died. Unfortunately, White’s family, who did not share his views, made a bonfire of his papers immediately after his funeral. After the Ballymoney meeting, a deputation went to meet the British Prime Minister Asquith on the 26th November 1913. The deputation was a mixture of businesspeople, trade unionists and academics, such as Professor Henry of Queens University Belfast, David Campbell of the Belfast Trade Council and Alex Wilson. The deputation emphasised to Asquith that those who were organising the Ulster Volunteer Force, an illegal militia established to resist Home Rule by force, were for the most part landlords, their tenants and their dependants. These paramilitaries did not speak for the Protestants of Ulster. Rev. JB Armour was quite vocal in dismissing Carson’s ‘Ulster Day’, the day of the signing of the Solemn League and Covenant, as ‘Protestant fool’s day’. He publicly denounced Carson, the Unionist leader, as ‘a sheer mountebank’ and ‘the greatest enemy of Protestantism’. He even wrote that Carson ought to be tarred and feathered! A public platform party against partition was formed. Its forty or so public representatives were distinguished Protestants, such as J. Goold-Verschoyle, Robert Carson, James Hanna, Rev JB Armour, WD. Hamilton and JL. Taggart. Also a member was Alec Wilson, the son of one of the directors of the great ship-building firms Harland and Wolff. Interestingly, Harland and Wolf expressed an indication at the time that they were opposed to partition and that they supported Home Rule. Unhappily, the Ballymoney meeting was a once-off and any activity that sprung from it failed to turn the tide of Carsonism. Carson and his followers in the Unionist Party and the UVF rose to popular power in Ulster in a wave of anti-catholic sentiment. The result was the British-imposed partition of Ireland. However, the Ballymoney meeting did show that a significant minority of Protestants in North-East Ulster were opposed to partition. At the Ballymoney meeting Roger Casement emphasised the links between ‘the Catholics of Wexford and the Presbyterians of Antrim who had fought together on the same side little more than a hundred years previously’. He said the ‘Protestant Dissenters of Ulster’ had played a very progressive role in Irish history, and what a wonderful contribution they could make to an all-Ireland state. He hoped that Catholics and Protestants would unite and that they would ‘set the Antrim hills ablaze’. * A Public Talk on the Alternative Covenant will be held on 3rd October in the Belvedere Hotel, Denmark Street, Dublin, at 7pm. Speakers to include Rev David Frazer and Bill O’Brien. All Welcome.